If ever there was a color darker than black, Georgista would qualify! We've been told that she is a color producer. She has fit nicely into our herd, but she does make herself heard on occasion. 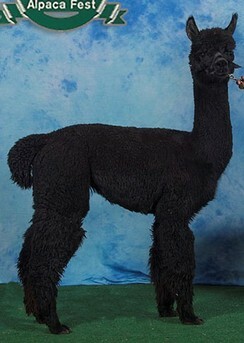 Georgista gave birth to a TRUE Black female cria, SSKY Georgy Girl, on 7/15/2013 sired by Nova's Avarice. On 9/13/14 Jewell gave birth to SSky Glissando. She is bred to SA Peruvian Mad Hatter for 2015.